When you look in the mirror, what do you see? Do you see an unattractive smile due to misalignment issues? If so, you are not alone. Although you have probably considered orthodontics in the past, you have yet to take the plunge. Often, braces are only viewed as offering cosmetic benefits, but what you may not know is that properly aligned teeth improve your oral health. Now, you can invest in your teeth and gums while also boosting your confidence with braces in Boston. We offer the most preferred treatment for adults with Invisalign to help you get a healthy smile. If you have overcrowded, gapped, or rotated teeth, you probably do not love the appearance of your teeth. You know that braces will improve how your smile looks, but you do not want to get treatment just for cosmetic purposes. However, by investing in braces, you will help to ensure your smile lasts a lifetime by reducing your risk for serious complications. Prevent Tooth Decay: When your teeth are not properly aligned, they are more difficult to clean. As a result, brushing and flossing are not always enough to prevent tooth decay. However, with a straight smile, they are easier to clean, eliminating unnecessary hard-to-clean places. Prevent Gum Disease: It can be difficult to properly floss your teeth when they are not correctly aligned. This can lead to an accumulation of plaque and tartar, increasing your risk for gum disease. By aligning your teeth, you will protect your gum health for a healthy smile that lasts a lifetime. Reduce the Risk for Injury: Misaligned teeth are more likely to suffer damage if there is trauma to the mouth. When you have protruding, tilted, or rotated teeth, they will take the brunt of the force. As a result, they are more likely to break or get knocked out. At Brooks Dental, we understand that you are already self-conscious about your teeth. You do not want to add the appearance of braces to your insecurities. Now, you can get a straight smile with a sophisticated and discreet treatment with Invisalign in Boston. Invisalign uses clear aligners that are worn over the teeth to gradually move them into position. No one will be able to tell that you are wearing them. You will enjoy added confidence with a treatment that is less restrictive and more comfortable than traditional braces. On average, your treatment will only take about 12 months. With the convenience you need, now there is no excuse not to get a straight smile. 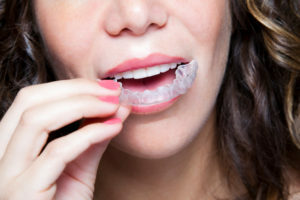 Invisalign is effective for treating several alignment and bite issues while producing high-quality results. However, it is not right for everyone. You will need to schedule a consultation to see if you are a candidate. We will evaluate your teeth and discuss your desired results to ensure it is right for you. Get a healthy, straight smile today with the clear choice in orthodontics.